Elizabeth Burns: Happy Birthday, RIF! 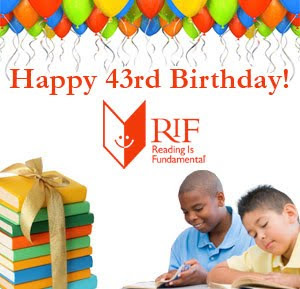 RIF (Reading is Fundamental) is 43 today. What is RIF? From the website, "RIF is the oldest and largest children's and family nonprofit literacy organization in the United States. RIF’s highest priority is reaching underserved children from birth to age 8. Through community volunteers in every state and U.S. territory, RIF provides 4.5 million children with 16 million new, free books and literacy resources each year." So how to celebrate the big 43? Have a month long party! Over at the Rasco From RIF blog (Carol Rasco is the CEO of RIF), they've been blogging up a storm. On Mondays: Monday Memory, columns by people who have been with RIF since it started. How many times do you get to read a blog post by Lynda Johnson Robb? On Fridays: Fallback Fridays, reminiscing about RIF programs throughout the country. Have memories of RIF, as a kid or volunteer? Head over to Carol's blog and share, and you get a chance to win a signed book. You are kidding right? I did this when I was like 10! So cool to hear it is still around. Liz, tonight in reviewing all the wonderful birthday wishes for RIF I realized in looking at yours again the comment I "thought" I left on the big day did not make it into print. We were so excited to see you had acknowledged RIF's birthday in such a big way; thank you! And Michelle, do come visit us at www.rif.org - there is SO much there for children, families and educators. 43 and going strong!